To kick off the 2018/19 NBA season Satis&fy partnered with House of Hoops (Nike + Foot Locker) to create Courtside. This retail and customization pop-up tour centered around the sport, style, and storytelling of basketball. The first iteration of Courtside debuted in Los Angeles for Lebron James’ first game with the LA Lakers in October 2018. Through several rounds of design and budget discussions, the cubes started coming to life. Each cube measured 8ft square and was fabricated to include: steel substructure, wood framing, LED lighting, integrated peg-walls with display hardware, custom graphic and branding assets and ADA accessible ramps. Over the course of the 3 days the activation was open to the public, thousands of people went through the experience. Countless pairs of shoes were customized and several products sold out entirely. In the end the client was elated and we were proud of such an usual style of build especially in such a short timeline. With less than two weeks from receiving the project to launch date, our bi-coastal team worked simultaneously to execute the retail component for the Lebron James 16 campaign. 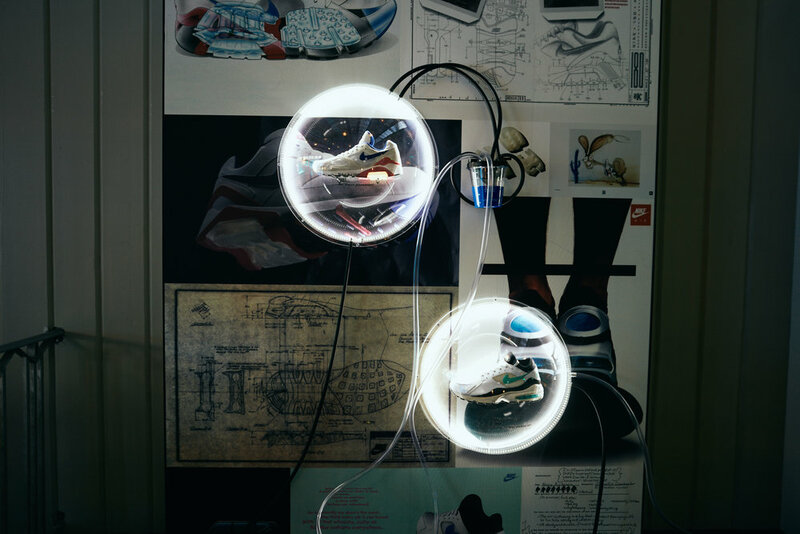 In both locations, Nike Soho in New York and Nike at The Grove in LA, the installations combined scenic and video services, bringing the vision of the LBJ16 shoe launch to life. Bringing elements of a city construction site into a retail space was the inspiration from the clients design team. This included scaffolding and concrete props. In the installation at the LA location, we also included a custom built shattered backboard display at the entrance to the store. In both locations, a custom monitor array displayed content speaking to the LBJ16 shoe. Working with the LA Nike team, we produced a brand activation space to launch the Nike and Carhartt WIP collaboration footwear collection.We designed a workshop themed space aligned with the tradesman Carhartt brand identity, using materials found on a typical construction site, and located within the Bodega Store in Downtown Los Angles. We created custom workshop themed product displays and furniture using builder grade materials, with the signature Carhartt orange used selectively throughout each element. 2x4 lumber, cinderblocks, workers sawhorses, and stacks of plywood sheets were utilized to create a cohesive workshop. We decorated the space by installing Nike and Carhartt campaign imagery and graphics, printed on Carhartt duck cloth canvas true to brand feel. We also brought in an old school 80’s CRT television set, acquired from a coworkers parents garage, to fit the lo-fi aesthetic of the Carhartt brand, which looped content created by the Nike brand design team. We installed sewing machines and tailoring supplies for a complete clothing customization workshop experience, in partnership with Lot, Stock, and Barrel, an LA based clothing customization team, to create personalized and unique Nike + Carhartt garments for the launch party guests. Partnering with design agency, Industry PDX, we helped to successfully launch HP’s newest product in New York City. The event announced the release of the Spectre Folio, a premium PC innovation with state-of-the-art design and functionality. Starting the night out with a press release at an event space inside Manhattan’s Chelsea Market, followed by a cocktail party experience, with a rotation of VIP influencers. We worked closely with our design partners to bring this experience to life, having provided both scenic and technical production, as well as on-site event management. We provided all scenic elements, from custom built fixtures to large format graphics. Our tech team tackled light, sound, and video throughout. In May of 2018, Rosie Lee reached out to satis&fy to partner on a project for Ketel One. Earlier that month, Ketel One debuted their new Botanical line which is low in calories, has no carbs, and that will strike home with the health-conscious consumer. The event featured a workout class as well as the opportunity to enjoy the new line of vodka. Hosted at the 620 Loft & Garden in Roc Center, satis&fy worked closely with Rosie Lee to meet the designated budget, hit deadlines, and bring the design to life. Satis&fy were tasked with producing all scenic elements, technical production, and gifting. The majority of scenic items were created in house and satis&fy worked closely with partner vendors to execute the additional elements. The final result was a successful media and influencer event that drove social engagement and generated buzz for Ketel One’s new product. In 2017, Dyson partnered with satis&fy to install over a hundred of long-term fixed furniture and retail elements throughout 4 stores in the United States and Canada. This was our first time working with Dyson and satis&fy has built an incredible relationship with them. They know us as a company they can rely on to provide the highest quality fixtures, pivot with any change and do it all with a strong and knowledgeable team to support them. James Dyson, the founder and chief engineer visited the Fifth Avenue store in New York before the opening. He later sent a message to the Dyson team that satis&fy had been working with, speaking very highly of the store and specifically mentioning that all the fixed furniture was “executed perfectly”. Something he does not say often. All involved should feel very proud in the success of this project. Leading by example, the EQUALITY initiative follows Nike’s recently announced partnerships with MENTOR and PeacePlayers International and took place amid the brand’s annual Black History Month (BHM) series of releases. Taking cues from the imagery that fueled EQUALITY’s campaign, a team of satis&fy’s best transformed NikeTown NY’s retail space into a powerful visual statement, rich with striking portraits of athletes and bold typographical messages. Exclusive EQUALITY and BHM apparel entombed in gold and black product cases popped against glowing VC-Grid pixel controlled displays — finished to perfection with a smoky, mirrored surface. At the installation’s heart, an evolving digital tower built from the portraits of both consumers and cultural icons — snapped in a nearby photo booth and delivered in real time — served as a shining beacon of solidarity and inclusiveness while providing guests with a unique, printed takeaway. At satis&fy, our commitment to diversity, equality, and inclusion is a big part of who we are, and we’re honored to have played a hand in a project that so diligently reflects our beliefs. Inspiring athletes to push their game to the next level, our latest installation at NikeTown NY embodied Nike’s “UNLIMITED” ethos on all fronts. 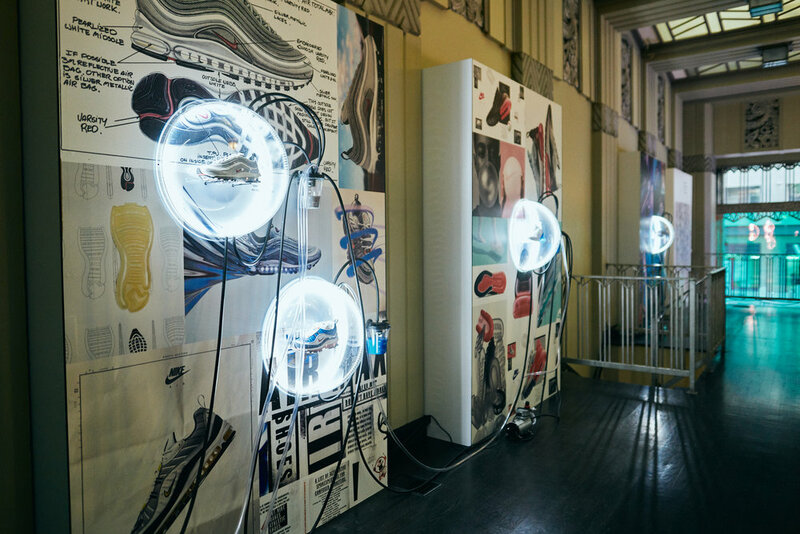 A showcase of the brand’s latest innovative footwear, the installation called upon a 30-person satis&fy crew—over the course of 5 nights—to deliver a dazzling visual message that gave a nod to the world’s top Olympians and the sports they dominate. Seizing the opportunity to craft an attention-demanding centerpiece, our specialists put their skills to the test, giving way to a hulking 20’ wide by 40’ tall LED wall and a series of chromed hanging mannequins, suspended in action and ascending 4 levels of the retail space’s refreshed sleek, metallic interior. Breaking the futuristic apparel’s design down to a science, custom lightboxes highlighted the technical specifications of the groundbreaking footwear, loaded with exploded models and conceptual diagrams—a perfect addition to the build’s otherworldly, mirrored display pedestals and carefully curated ambiance. Always defy, never comply. This is the foundation of Jordan’s legacy. In 1996, Michael Jordan teamed up with an unlikely cast of animated heroes to champion the intergalactic basketball game of a lifetime, all while creating an iconic, box-office hit in the process. 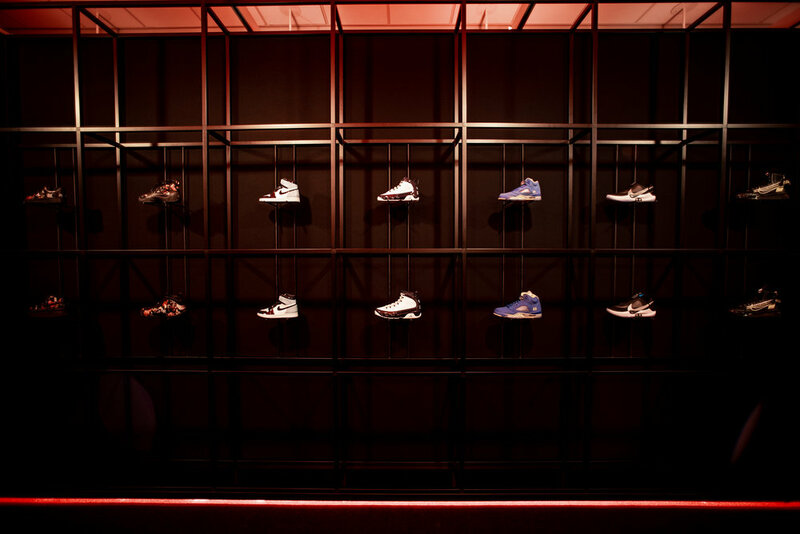 To many, Space Jam isn’t just a basketball film, it’s a name synonymous with nostalgia – and Nike’s latest series of retail installations in New York, Chicago, and San Francisco undoubtedly emanated nostalgia. If there was ever a doubt, the magnificently suspended, glowing 15’x15’ Jumpman logo above NikeTown NY’s atrium makes it clear: you’re in Jordan’s territory now. Below, otherworldly display pedestals – comprised of 3D moonrock inserts, acrylic bases, and impeccable lighting – pay homage to the film’s galactic atmosphere. The already impressive NikeTown NY LED wall was pushed to its limits, expanded and primed to accommodate Space Jam and Jordan-branded video content. Outfitted with a pair of light boxes, flanking a striking infinity-mirror display (compliments of our R&D team’s recent efforts), the building’s East Pavilion showcases authentic pieces of Space Jam lore and the current product line offered in celebration of the film’s 20th anniversary. In the building’s exterior displays, wheat pasted graphics frame both an illuminated backboard and flawlessly fabricated moon. Cheers to 20 years, Space Jam. Thanks for having us on board. Shopping was yesterday – experiencing is tomorrow. Nike once again changes the game, sprinting into new realms of sports retail with the launch of its groundbreaking five-story, 55,000-square-foot retail space in SoHo. Undoubtedly a store of the future, Nike set the standard for all interactive retail installations to follow with an intoxicating array of technology infused experiential Trail Zones focused on maximizing consumers’ performance, while simultaneously offering an unparalleled level of personalized shopping experience. Upon approaching the store, visitors are immediately greeted by high-tech accents: glimmering LEDs imparting movement on the building’s façade and the underside of the first floor’s escalator, foreshadowing the immersive digital content to be found inside the giant’s walls. 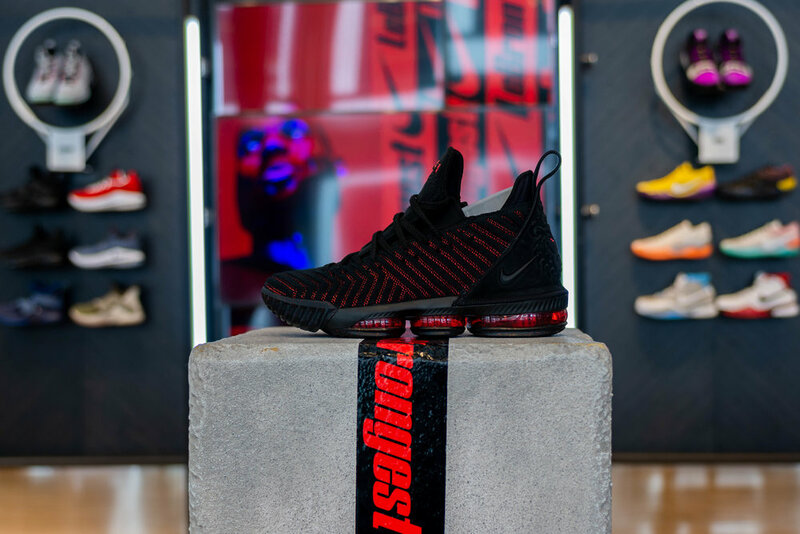 Taking cues from the successful VR technology behind Jordan’s “Last Shot” experience back in 2015, the brilliant minds at Nike repackaged the experiential trial zone into a bite-sized, retail-focused rendition. 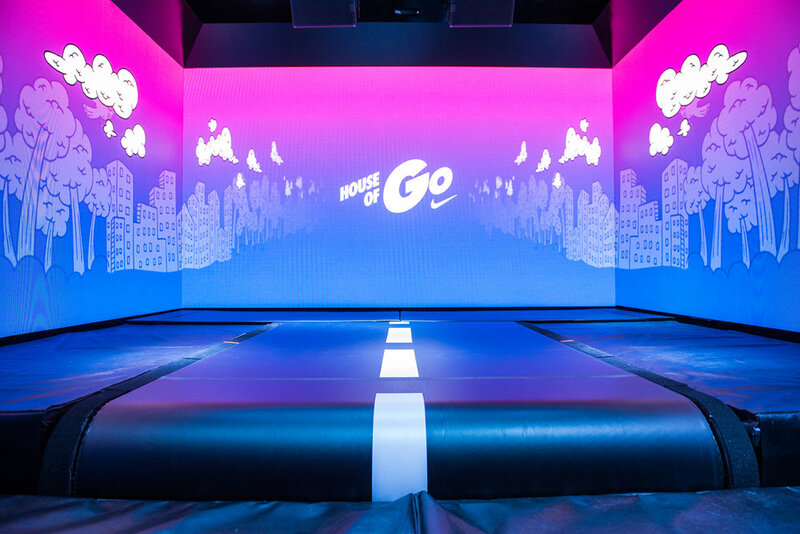 Complete with a Kinect sensor-integrated half court to capture and analyze personal performance, the Nike+ Basketball Trial Zone instantly transports consumers to iconic NYC playgrounds – courtesy of the massive displays adorning the walls. Nike Running aficionados were not left out of the equation; athletes at the new SoHo footprint are offered the opportunity to put new Nike footwear through its paces atop a digitally-infused treadmill – an experience only previously seen during Nike’s “Forces of Nature” event at NTNY and the 2016 Olympic Track and Field Trials; we were lucky enough to support Nike on both of these projects. Runners are treated to real-time performance data while blazing through trails in iconic Central Park. Beneath a series of intricate 3D-printed mannequins – seemingly suspended in time – the Nike+ Soccer Trial Zone plays host to 400-square-feet of synthetic turf, and a series of one-on-one training sessions with in-store professionals. Keeping true to their mission statement, Nike helps athletes step up their game by saving individual training results from each session. An installation of this magnitude calls for the best team in the business – and we were there to answer the call. With teams from four international satis&fy branches, 10-30 crew members on site daily, and a month of hard work – we’d couldn’t be more proud of the result. An event of undeniable historical significance - for America’s premier athletes and Portland’s satis&fy team alike - Nike’s footprint at the U.S. Olympic Track and Field Trials in Eugene, OR called for a hands-on consumer experience of unmatched ingenuity. Stepping foot into the three interconnected igloo shaped domes, visitors were invited to live and breathe Nike’s rich history in the world of running – in addition to breaking a bit of a sweat atop a futuristic treadmill. Visitors partaking in the Nike specialist lead consumer journey, marveled at the two iridescent honeycomb shaped sculptures centered in the “Innovation Dome”. Built by our skilled craftsman according to Nike’s design, these customized pieces were inspired by the 3D printed spike plates found on the bottom of the Nike Zoom Superfly Flyknit - an exclusive one off design, engineered together with Gold-medal winning American sprinter Allyson Felix to help her repeat her success back in 2012. The pinnacle of the installation - the interactive “Footwear Trial Dome” - gave consumers an opportunity to put their own running skills to the test. After strapping on a fresh pair of Nike’s new LunarEpic Flyknits, consumers were invited to board their designated treadmill where they were instantaneously catapulted into an immersive virtual reality running experience, racing against one another, as well as, Olympic record holder Evan Jager. In collaboration with MIT’s Center for Collective Intelligence, Nike called upon industry influencers (designers, climate experts, materials specialists, and more) to announce a four-month long materials contest that aims to unearth some creative solutions to change the way our society values and uses fabric and textiles. Our design for the meeting space inside New York’s Glasgow Caledonian University was developed to match the inventive spirit of the occasion, infusing excitement and energy in typical Nike fashion. Bold accent colors popped dramatically against a visually stimulating monochromatic backdrop while prominent vinyl lettering served to deliver powerful messages that tied seamlessly into the ideology of the competition. The reoccurring message and theme behind Nike’s first Global Merchandising and Sales Leadership Team meeting inside Portland’s Leftbank Annex was “One Team”—a message we were brought on board to help deliver both visually and creatively. With an added importance on consistent and prominent Nike branding, massive floor-to-ceiling banners within the venue and an impressive collage of eclectic Nike imagery waited to greet guests at the entrance. Presentations were delivered from a fully outfitted audio and video enabled stage while attendees kicked back in premium, plush seating options that oozed luxury + style. New York winters are notorious for being tough—especially for the thousands of skateboarders forced to trade in their decks for umbrellas during the frigid, damp season. Looking to change the game, Nike SB called upon a New York-based satis team, LAND-SEE, and renowned skatepark designers, California Skateparks, to help athletes escape the winter. Located in Williamsburg, Brooklyn, the reclaimed warehouse space was transformed into fully SB-branded skatepark, designed to accommodate a series of Nike athlete-led skate sessions, show off current product lines, and provide an unparalleled indoor skate experience. Complete with full AV functionality, multiple furnished rooms, revamped plumbing, and an overhaul of the electrical infrastructure, the reconstruction of the warehouse resulted in a nearly unrecognizable, premium consumer space that drew attention from media and skateboarding devotees around the world. Located on 135 Bowery in New York City, the ‘Hike Nike NYC’ pop-up shop functioned as a unique, multi-purpose temporary installation, both showcasing the upcoming line of ACG gear and serving as the trailhead for a series of Nike-led hikes through the urban jungle.